One thing that weddings really emphasize is that for better or for worse, families are forever. You may only see your cousins occasionally, you may only interact with your aunt on Facebook, but you’ve known them their whole lives and they’ve known you. And then, after buying a house together and having three kids, one decides to marry his girlfriend and you all get together and get a bit sentimental about being in such a great family. This wedding was a bit unusual in that although it was in Cairns, nobody attending was actually from Cairns. The happy and very attractive couple are from Darwin, other family members and friends came from Brisbane, Sydney, Canberra, and one very dedicated friend from Tasmania. Which made the rather excellent turnout a testament to how fond we are of Nathan and Fiona. Of course it was a beautiful wedding. The setting was terrific, the ceremony conducted by the most enthusiastic celebrant I’ve ever seen. I half expected him to start auctioning off the bridesmaids afterwards “two hundred I have, two hundred, two hundred, can I get two fifty”… Photos ensued, and most fortunately there was a conveniently located mini golf course close enough you could throw a can of Fourex at it to entertain the kiddies until dinner. I amused myself counting the number of people mistakenly congratulating the groom’s identical twin. I lined up and congratulated him myself. There were many good things about the reception. All the kiddies had a bag of colored pencils and a coloring book to keep them busy, and there were a lot of them, all really well behaved. The best man commented that the reception had a bit of a daycare feel to it. The take home gifts were personalized M&Ms, which also kept the kids going, and coldie holders with the wedding details on it. This pleased both myself and my husband. He likes to bring home these things as souvenirs, and had his eye on one that featured crocodile coitus that was a lot more adventurous than that which we witnessed yesterday, so he won’t need to buy it after all. 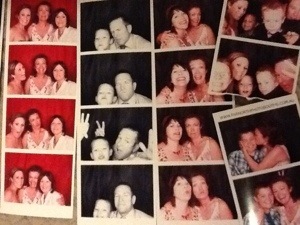 We particularly loved the photo booth, every wedding should have one. The food was great, the music was decent and often performed by a young lady who also sang before the wedding, she must have been exhausted at the end of the night. Unlike the Horror from Outer Space, who decided he’d be having his usual bedtime, thanks. As we were staying in the same building this was an easy request to fulfil, then his brother and sister were able to dance the night away with their cousins and second cousins and great aunts in law and various other partial relations we were unable to determine on the night. Thanks Fiona and Nathan for inviting us to your wedding, it was a beautiful thing.